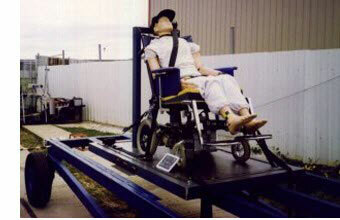 Automotive Safety Engineering (ASE) designs and tests frames for ambulances that incorporate stretcher locks, patient restraints, and equipment restraints. Patients and items of equipment weigh 30-40 times more than their static mass in collision conditions; therefore inadequately restrained patients and equipment can result in severe or fatal injuries to the patient and/or ambulance officers. "Any internal or external fittings are illegal if they are likely to increase injuries of vehicle occupants". 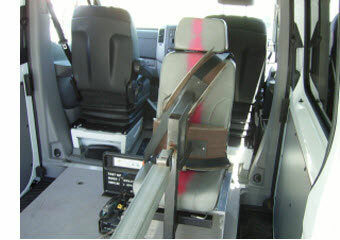 All internal cargo that shares space with the vehicle occupants must be restrained. ASE's Equipment, Patient & Stretcher Restraints undergo extensive testing to ensure they not only perform the function for which they were designed, but also meet all legislated Standards and associated Design Rules. It is important that the tested stretcher remains attached to the ambulance floor, and the test dummy restrained to the stretcher using a specially developed patient harness. Full Frontal and Side Collision testing can be conducted. For further information about ASE's Equipment, Patient & Stretcher Restraints please contact ASE.